Jonathan Moore cemented his position as new stable jockey for Rebecca Curtis when steering Irish Cavalier to a surprise success in the bet365 Charlie Hall Chase at Wetherby. The seven-year-old had too many guns for talented and seasoned campaigners Menorah and odds-on favourite Cue Card to give the Irish rider a notable triumph in his first season in the UK. Dynaste set the early pace from Virak and Wakanda with Cue Card never too far away. Paddy Brennan sent Colin Tizzard’s star performer into the lead a long way from home in a bid to repeat last year’s success, but he could not shake off all his rivals. 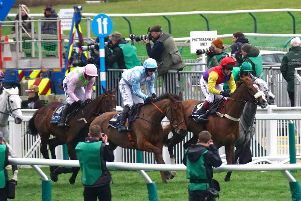 Irish Cavalier (16-1) landed in front at the second-last fence and plugged on courageously to lift the Grade Two contest by three-quarters of a length from Menorah, with Cue Card, the 8-11 favourite, only third. Curtis said: “I thought he’d run well, but I didn’t think he’d win. “He’s still only seven and he obviously gets three miles. He’s improving every season. “There were a couple of blips last year, but they were when our horses were wrong - he did win at Punchestown. Assessing plans, Curtis said: “It’s possible he could run in the Betfair (Chase, Haydock on November 10), we have to start thinking of all the top three-mile races now. Moore, enjoying his biggest career victory, said: “That was my second ride in a Grade Two when I can’t use my claim. “It’s one of those races you dream about winning and it’s great to get it under my belt. “Early on he was a bit gassy and we went a real strong gallop. My lad was a bit on his head but second time round he started winging fences down the back. I was confident then and I just wanted to stay on Cue Card’s heels. Philip Hobbs said of Menorah: “He just met a couple of fences wrong in the straight and that might have cost him. “Take nothing away from the winner, but we’d have been closer without the mistakes. Tizzard, meanwhile, was not too disheartened by the eclipse of Cue Card. He said: “He just got tired, that’s all. I thought he was going to win, but he tired after the second-last. “We took him for a racecourse gallop because if we hadn’t I didn’t want to wish I had done. “He’s only been beaten two lengths, so we’ll go to Haydock (Betfair Chase) and see where we are at.